BAE 1073MPL 500 Series Microphone Preamplifier, which is a compact mic pre-version of the BAE 1073 design for 500 compatible racks. 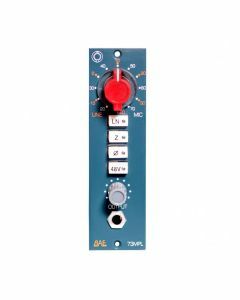 The BAE 1073MPL preamp uses the same All discrete Class A design. This is the 500 Series version of the 1073MP (a mic pre-amp version of the 1073 equaliser) having the same well-known characteristic Class A sound with its harmonically rich low end, slight resonant highs, and maintained focused mids. Two selectable impedances makes the 1073MPL work well with a variety of microphones. As a coloured and versatile mic-pre, the 1073MPL maintains its sonic signature across a wide bandwidth. All Class A, transformer-coupled design in a 500 series module. Line level capability for extra versatility as a line preamp. Same Carnhill St Ives transformers as the 1073 and 1084.